The noise from motorcycles may be annoying to some, but bikers say it saves lives by drawing attention to them when they're in a driver's blind spot. DOWNTOWN — Riding a motorcycle without a muffler — an offense previously punishable by fines of up to $100 — could now cost bikers five times more than that if they're caught in violation of a new ordinance Downtown. Loud motorcycles are "a major quality-of-life issue" in his River North and Downtown ward, Ald. Brendan Reilly (42nd) said, criticizing the "many motorcyclists [who] alter their mufflers to be much louder than legal decibel levels, which contributes to noise pollution throughout Chicago, especially in Downtown Chicago's skyscraper canyons." Reilly's ordinance, passed by the City Council last week, amends the municipal code concerning exhaust systems for cars and motorcycles, altering the language to find any vehicle lacking a muffler in violation, and raising the possible fines from a maximum of $100 to $500. Patrick Jones, president of the Chicago chapter of ABATE, a motorcycle advocacy group, conceded that even though many motorcyclists say they make their bikes louder for safety reasons, regulations capping their noise level are fair. "There was a slogan back in the '80s, 'Loud pipes save lives,' and they still do, but there's gotta be a limit," Jones said. "Especially Downtown, with the loud noise bouncing off the buildings, it is a nuisance." But Jones said while the new ordinance is an improvement on Reilly's initial proposal, which called for a maximum fine of $1,000, he'd prefer to see an enforcement approach that can be applied equally to two- and four-wheeled vehicles. Jones said cars with modified mufflers are often the culprits when residents hear loud engine noise in the Loop. "My concern is: a police officer pulls you over for loud pipes," Jones said, describing a hypothetical application of the new ordinance. "You can look at a motorcycle and see if there are mufflers on the bike or not. You can read the IDOT label on it that's required on all pipes. But with a car, a police officer's not going to go underneath a car, pull over, look underneath and look at his muffler." Jones said for that reason, he and his group would prefer to see a policy that focuses on a maximum decibel level, rather than enforcing based on the absence or presence of a muffler. State Police use decibel meters to enforce noise regulations on highways, but most city police officers don't have access to that equipment, Jones said. While Jones said he'd like to see decibel reads incorporated in enforcement so cars and bikes can be treated equally, he also called the maximum $500 penalty for altering mufflers on either vehicle "fair." "We have a very good working relationship with the City of Chicago, they've gone out of their way to accommodate motorcyclists," he said. "I believe that's a fair price. "If you want to do something illegal, you should be willing to pay money for it." When the ordinance was first proposed, bikers balked at the hike in fines. "The mirrors [on cars and trucks] are not adjusted to see bikes. 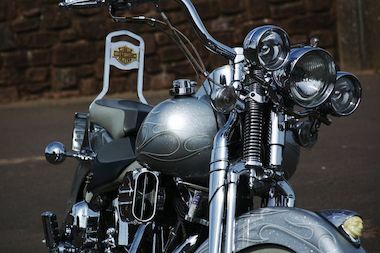 They're adjusted to see a big car," said Pete, a Harley-Davidson rider who told DNAinfo.com Chicago last winter that he made his bike "about 30 percent louder" with muffler alterations. "I mean, sure, it might wake somebody's kid up when I'm coming home at 1 a.m.," he said. "But the lady in the minivan not looking in her blind spot? She will kill you."